Training Plans on Android – Zombies, Run! 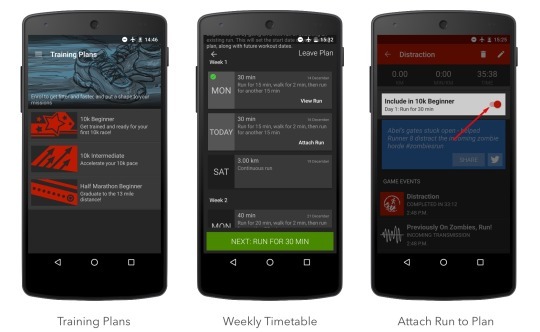 As promised, the eagerly awaited Training Plans are now available for all ZR players on Android – for FREE! Ever wanted a way to schedule your runs across multiple weeks? Wanting to train for a 10k (maybe the upcoming Spring 2016 Virtual Race…) but need a little extra guidance? Simply grab the latest update from the Play Store, and check out the new Training Plans option on the Missions screen. Once you enrol in a Training Plan, you’ll be given a weekly schedule of runs. After completing a qualifying run on the correct date (by meeting its time or distance requirement), you can tap a switch which marks it as complete in your Training Plan schedule. We’ve included two 10k plans to begin with: 10k Beginner and 10k Intermediate. These are 7-8 week plans intended for those who can already run a solid 5k and want to train further. There is also a Half Marathon Beginner plan, for those comfortable with running a 10k who want to progress.